(Louisville, Kentucky - August 31, 2011) - James E. Helzer of Arlington, Texas, one of the leading and most progressive breeders of racing Quarter Horses, has been named 2011 recipient of the John W. Galbreath Award for Outstanding Entrepreneurship in the Equine Industry, presented each year by the University of Louisville’s Equine Industry Program. The Program, which offers the world’s only AACSB-accredited business degree with an equine major, has presented this achievement award since 1990. All Galbreath Laureates were honored for outstanding achievements in business, which led important – and broadly varied – segments of the equine industry in a positive direction. “We believe that it is entrepreneurs ultimately who alter and improve their industries through the creation of innovative and aggressive enterprises that succeed in serving new or existing markets,” said Rich Wilcke, equine-business instructor. “Jim Helzer exemplifies an entrepreneur who’s willing to risk his own resources and combine creativity and sound management to succeed. His commitment to his sport – Quarter Horse racing – has been absolute, and his enterprises have helped to improve the availability of – and the market for – genetically superior bloodstock through his state-of-the-art facilities in Texas, in New Mexico, and in Oklahoma,” explained Wilcke. The Galbreath Award is named for the late John W. Galbreath, a native of Ohio who built a local firm into an international development company. His sporting interests included the Pittsburgh Pirates and Darby Dan, a top Thoroughbred farm. 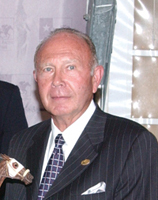 The longtime chairman of Churchill Downs, Mr. Galbreath is one of only two individuals who ever bred and raced the winners of both the Kentucky Derby and also the English Derby. Official presentation of a custom bronze sculpture, representing the 2011 Galbreath Award, was made to Jim Helzer on Thursday, September 1, before his peers at the gala party held for the connections of entries for the All American Quarter Horse Futurity run on Labor Day at Ruidoso Downs Race Course in Ruidoso, New Mexico. The past Galbreath Laureates were John A. Bell III; James E. “Ted” Bassett III; W. Cothran Campbell; John Gaines; Ami Shinitzky; Robert Clay; Thomas Joy; John Lyons; D. Wayne Lukas; Thomas H. Meeker; Denny Gentry; David Willmot; William S. Morris III; Scoop Vessels; Judith Forbis; Brian Mehl; Carol Rose; R.D. Hubbard; Marvin Beeman, DVM; David Llewellyn; and King T. Leatherbury.